All beautifull pictures, a feast for the eyes, Thanks for the inspiration, have a wonderful Day! Just a gorgeous group of ideas and inspiring photos. This gives me such a warm feeling in my chest when I think about my future home. love love love! Sipping my coffee, this was the best way to start my day. Thank you! That bedroom is so beautiful! 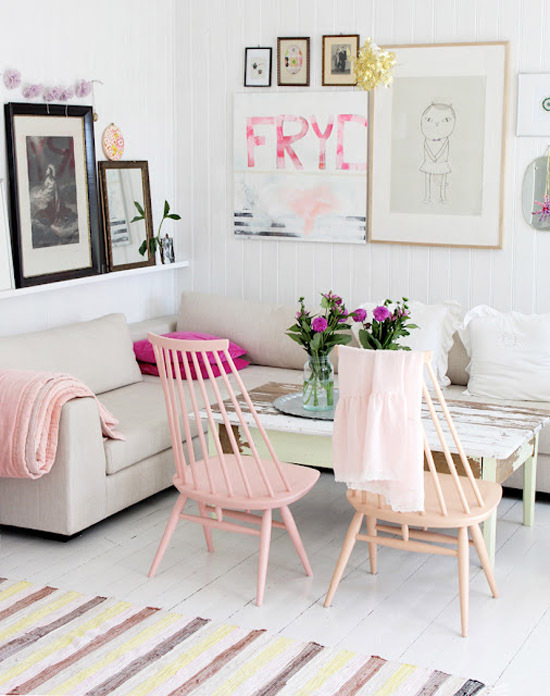 Thanks for sharing these inspiring and dreamy living spaces. I would be happy living in any of all of these spaces. They are PERFECT. Great artwork in the first pic! Thank you ladies - your comments are inspiring me! I would be happy to living in some of these ;) I love your blog! Those are gorgeous picks. But that kitchen seems to clean to have ever been used (teeheehee). I also love that backyard getaway house. Makes me think of sleepovers and summer time parties and all things warm, fuzzy and dreamy. I am still a sucker for pastels. AND tiny houses / tiny things. Which leads me to..."I'd Rather be Short"
Perhaps short readers will relate to these quirky illustrations?